Built in 1889, The Rosalie has been featured in Architectural Digest, Country Victorian, Reader's Digest And Southern Living , To Name A Few! The Rosalie is open for tours and weddings by advance appointment. J.W. Hill came to Eureka Springs in 1880 or 1881 with $5 in his pocket, but quickly became one of the wealthiest persons in Eureka Springs. 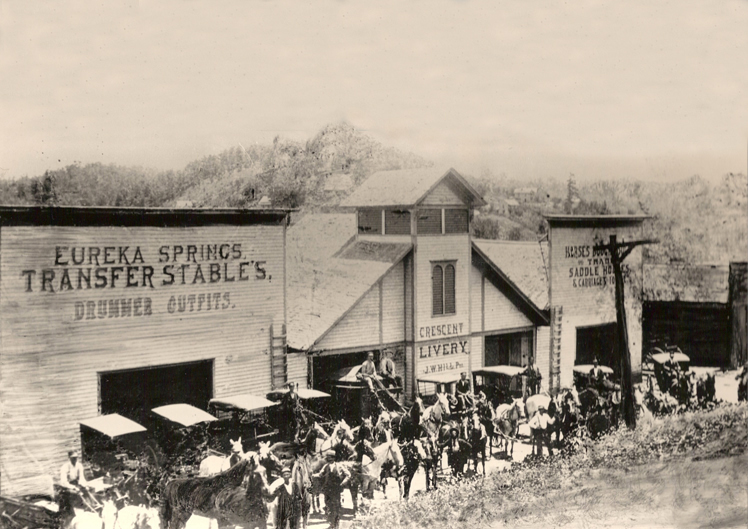 He bought a horse and wagon and founded the Crescent Livery and Eureka Springs Transfer Company. He kept expanding, buying more horses and wagons, and building stables to house them. 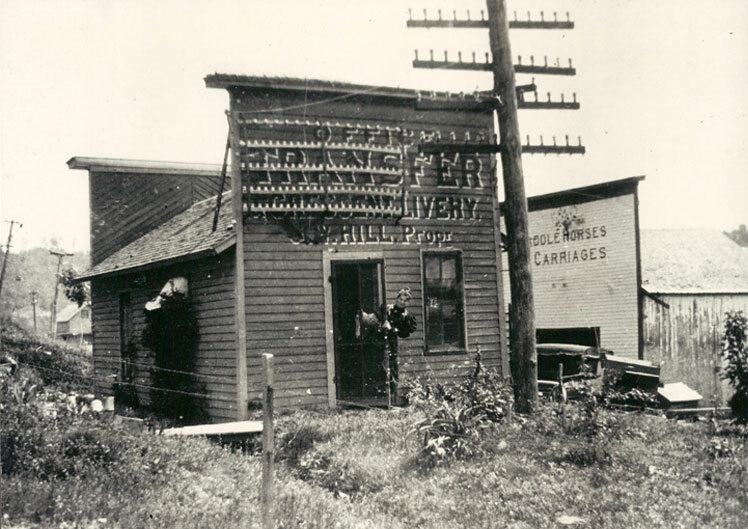 He secured franchises to transport people and the mail from the railroad stations in Ozark and Selgiman, Missouri to Eureka Springs. In 1883, he married Ada M. Foster, daughter of a wealthy publisher from Chicago, Illinois. Ada and J.W. had four children-- Leila, Lucas Van Allen, James "Jay" Wilson and Ralph Brownell. In 1888, Mrs. A.M. Foster (Ada's Mother and JW's mother-in-law) purchased Lots 1 & 2, Block 35 of the Clayton Survey. In 1889, J.W. 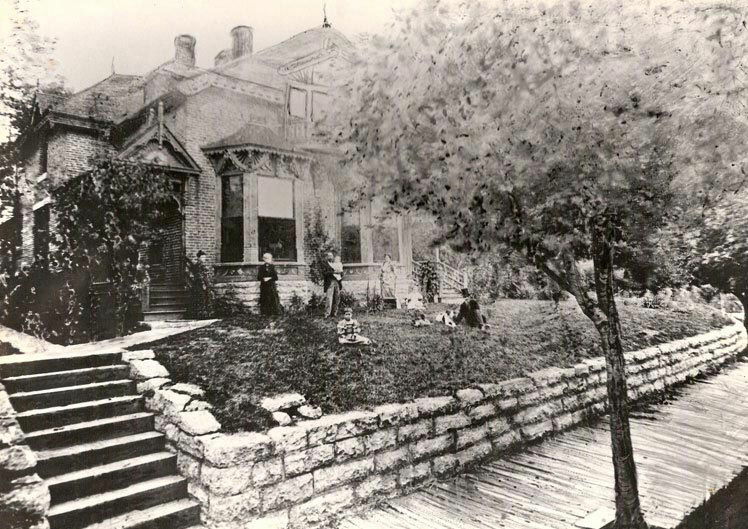 Hill bought the lots from his mother-in-law, and built the first brick home located on upper Spring Street (back then known as "The Boulevard"). It was constructed of bricks fired on site, and wood imported from New York. A combination of Steamboat Gothic and Eastlake architecture, the house was declared by J.W. to be "the prettiest and fanciest home on The Boulevard." It was reported that J.W. spent $17,000 building The Rosalie at a time when the average house in Eureka Springs cost between $500 and $1000. In 1893, J.W. attended the World's Columbian Exposition in Chicago, where the telephone was exhibited. Realizing its potential, J.W. came back and built a private telephone system between his home, the Crescent Hotel and the stables. J.W. used the system to schedule the carriages, replacing runners he had going up and down the hills to see how many people needed transportation to and from the railroad. J.W. then got a franchise from Eureka Springs and expanded the system, making it one of the earliest cities to be fully serviced by phones. At the time, there were less than 300,000 phones in America. The Rosalie was purchased by Charles & Lori Ragsdell in 2007, who have since done extensive intertior and exeterior renovations, including a new cedar roof and the installation of high-efficiency heating and cooling systems, electrical and plumbing upgrades, and repairing and replacing damaged woodwork and plaster. The Rosalie hosts small, intimate weddings, either in the double parlor or outside in a beautifully decorated gazebo. Tours are also available by advance appointment. Where better for your special day than 'The Prettiest and Fanciest Home on the Boulevard'? Small, intimate weddings are held in our double parlor, or groups of up to 25 outside in our beautiful gazebo, weather permitting. Click here for more info! From 1889 to today, The Rosalie has undergone major changes inside and out. Learn why the garage looks like part of it was sawed off... IT WAS! Click here to learn more. Learn more about the Eastlake and Steamboat Gothic elements used in building and decorating The Rosalie. And learn how many gables it really has... COMING SOON! The Rosalie is one of the most photographed homes in America. Here are some of our favorites, including some taken over 100 years ago! Click here for pictures and original artwork of The Rosalie. While The Rosalie is a private residence, tours are available by advance appointment. Click here for more info. For more information about Eureka Springs, please visit EurekaSprings.org.